Candy Bar Fundraising - Popular & Profitable! Candy Bar Fundraising – A Natural Craving! The best thing about candy bar fundraising is that candy bars are something that so many people crave... YES CRAVE! They just can't resist it, especially if they know they're helping raise funds for a good cause at the same time. It's what makes it such a great fundraising product. In fact there are just so many great things about chocolate candy bar fundraising. They're Popular – Most people love Chocolates or Candy Bars! Profitable – Many supplying companies offer excellent profit margins. Not Expensive – A cheap way for people to help out your cause. Has a Wide Demand! - Is wanted by all ages and both sexes! So you can make sales to the kids, the parents and the grandparents. Widely Fit Able - Chocolate Fundraising can fit in with any Fundraising campaign, event, or can even be a standalone Fundraiser. Simple Enough To Sell! - It's not the hardest thing on earth to sell, now is it? 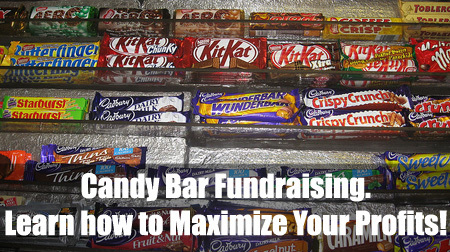 So if you decide to run a Candy bar fundraiser, you'll obviously want to make it as profitable as possible! And make sure your sales team knows how to SELL! Eg. Teaching and rehearsing a great sales pitch! I'd suggest that you read the food fundraiser guidelines (the incentive and sales pitch sections; plus the rest of the guidelines), to learn how to prepare and get the most out of sales team. You'll also learn a lot about fundraising sales through this excellent eBook. Offering incentives! Like prizes etc., to your sales teams for high volumes of sales or best five sellers! This is the best way of boosting sales, especially if you offer really great prizes... and if your team includes kids, it's a real winner!!! Promoting and Advertising - You must advertise your candy bar fundraiser as much as possible! Other than using word of mouth from your sales team, you should also promote through your fundraising website, your newsletters and any other Social Media platforms you use. Also consider giving an extra bonus to people who buy large amounts. For example, say that if someone buys 10 bars they'll receive a discount card for a local store. Make sure you include this fact in your sales pitch! When finding a company to supply your candy bars, consider the ones that will provide the largest profit margin but will still supply decent quality bars. If you sell poor quality candy bars, no one will buy from you! For USA and Canadian Fundraisers I'd recommend you get your fundraising Candy Bars from here. Another great option would be this company. Picking the right ideas and tips to use from the food fundraiser guidelines! I wish you all the best of luck with you Candy Bar Fundraising! Then head over here to start your Candy Bar Fundraising campaign!